VolvoxAureus - Amy's pottery: What makes a great kiln? What makes a great kiln? A friend asked me the other day, "What makes a kiln great?" I gave him a long-winded analysis of differences between kilns, based on my experience and my reading. I've only fired three wood kilns (two anagamas and a small wood-kiln), so I hope that other more experienced woodfirers will chime in with comments. This was somewhat stream-of-consciousness, so it's a mix of differences in technical/aesthetic results, and the physical/emotional experience of firing different kilns with different people. Most wood kilns fire to about the same temperature range, which is Cone 10-14 (2300-2400F). They need to get at least to cone 10 to melt the ash, otherwise the pots come out gritty or dry (though some people like that). The top temperature, and length of time the kiln is held at that temperature depend on the objectives of the firing, and lots of random factors like wood quality, weather, length of firing, etc. There are visually obvious differences between kilns in terms of size and design. There are smallish arched kilns with a square footprint which fire with only a half-cord to a cord of wood in a day or so, and there are anagamas and noborigamas which are big and long, usually built into a hill and shaped like a whale. They take 4-6 or more cords and 2-10 days to fire. I'm currently getting ready to participate in a week-long firing in a two-chambered kiln, which will be a great learning experience for me (and hopefully a lot of fun!). Type of door is a biggy. The door is made up of a large part that fills the main opening (so you have easy access for loading pots into the kiln), and a smaller door that you stoke through. Some kilns have solid doors that you wheel in place (nice! ), while others you have to brick up (sometimes hard!). The smaller stoke door can be covered by a little hinged door or a big swinging heavy piece of cement on a cable. I’ll let you guess which is better. 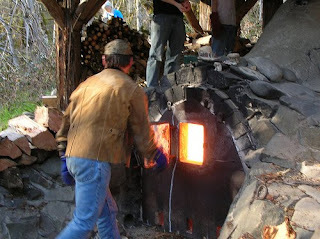 Also, some kilns really blast the heat when you open the stoke-door, while others are not as fierce. Kilns definitely vary in terms of evenness. Most anagamas (the bigger wood kilns) are long and tend to be cooler in the back. It can sometimes be hard to get the back as hot as the front. Most people take advantage of that by putting porcelain in the back because it can be happier at slightly less high temperatures. Some kilns have good areas and bad areas. I don't have much experience with this, because all the kilns I've fired are good all the way through. That isn't to say there aren't differences--pots in the front get more ash, pots in the back might end up with more flashing. The shape of the kiln and the way it is loaded has a huge impact on how the flame travels through the space and what happens to pots placed in different regions. But I've heard stories about kilns with bad areas where no one wants to place a pot. The type of wood makes a big difference, and many potters harvest wood from their own property, so location is a factor here too. Fir is good for ramping up the heat, but you burn through it fast and don’t get much interesting ash. Maple, cherry, alder, etc. are good for building up a coal bed and maintaining higher temperatures. Also I've been told you get better ash from medium-hard woods (which becomes the glaze on the pots) and really hard woods like oak can stall the kiln with a too-dense coal bed. It's good to have a mix, but wood can be expensive, so you take what you can get. I’ve heard that kilns at the coast get interesting effects from the salt air and the salt in the wood. The length of the firing makes a big difference too. Longer=more ash buildup on the pots and more time to play with raising and lowering the temperature. I’ve never done a long firing, so this upcoming week long firing will teach me a lot. Also, the new-to-me kiln has two chambers (the others I’ve fired only have one). The second chamber is for soda, which means some kind of salt/soda solution is added at some point during the firing. That makes a big difference in the surface of the pots, and is another great learning opportunity for me. I've only done one soda firing and it was in a gas kiln. There is also the question of oxidation vs. reduction. Different clays and glazes react better with more of one or the other. The timing of reduction and oxidization cycles makes a difference (because the clay and glazes reach different stages of vitrification at different temperatures and react differently to the atmosphere depending on the stage). The shape of the kiln, how well sealed it is, the weather, etc. can make kilns want to reduce more or oxidize more. There can even be variation in different regions of the kiln. Check out this article by Owen Rye if you're interested--there is a really useful explanation and chart explaining the oxidation and reduction cycles during stoking. And a lot of other really great information. Different people want different results. The kiln owner (or workshop teacher or group leader) generally has the final say, but participants can sometimes weigh in. So if the group tends to be more into dark clays and rough surfaces (sculptural stuff), the kiln will be fired quite differently than if the group makes mostly light-colored, functional, heavily glazed work. The group of people make a big difference in the experience of the firing. Drama=bad. Good cooking=good. I like most everyone I’ve fired with so far, but conflicts can arise and make a firing a less good experience. Fortunately those are few and far between, and usually easily resolved. Potters are pretty nice people as a rule. So that's my analysis of what makes a kiln great. There isn't a simple answer--there are so many variables. Please, if you have something to add or if I'm completely wrong about something, add a comment! After April, I'll have a new kiln to add to my firing resume, and probably a few more bullet points to add to my list. 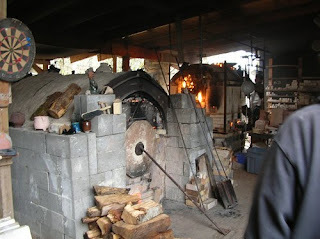 I have never fired a wood kiln, but I enjoyed hearing your thoughts about them. The "good cooking=good" part made me laugh! People make the biggest difference in events, it's true. I hope to get into a workshop or something this year to try out wood firing. I think the time commitment of a wood firing is what scares me off, but I have been loving the finishes I see from the wood kilns. Thanks! Tks for sharing your experience. Great post!